Inspirational quotes flood my Facebook and Pinterest walls and for good reason…words have power. They have the power to inspire, motivate, and lift the spirit. I collect quotes (you’ll get a peak at a couple of pages in my journal further below) and incorporate them into my blog posts and art. 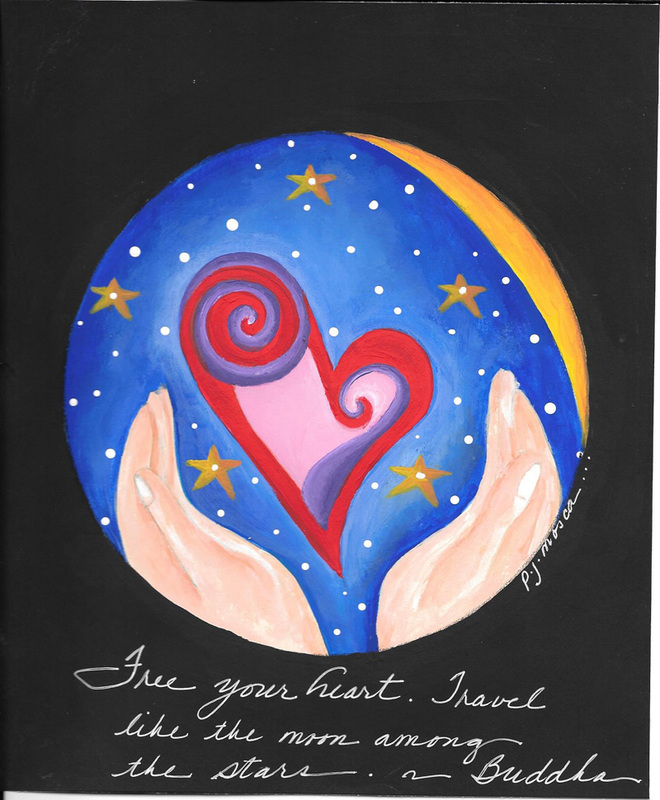 If you are looking for some fresh inspiration for your mandala practice, start with a quote that speaks to your heart, lifts your spirit, inspires you to say YES to life. When I read this quote it spoke to how I was feeling at the moment. 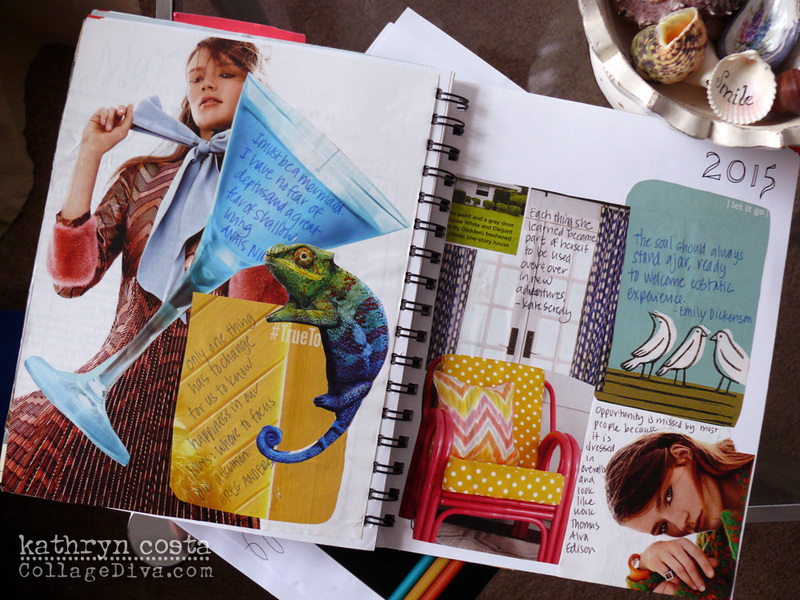 My head was swirling with so many ideas. 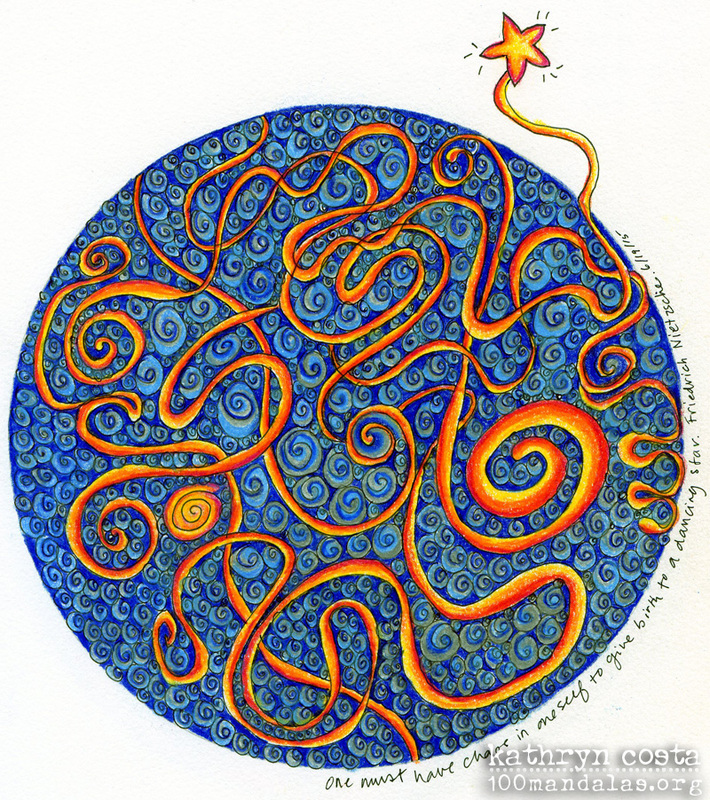 I knew instantly what I wanted to draw in my circle: lots and lots of brightly colored swirls, twisting and tangled with one extending beyond the boundary with a star tethered to it. I often draw tight little spirals that represent my creative ideas. They show up here in the dark background. I see this mandala as my brain filled with lots of ideas and the orange ribbons are the ideas that I’m thinking about and getting my attention. 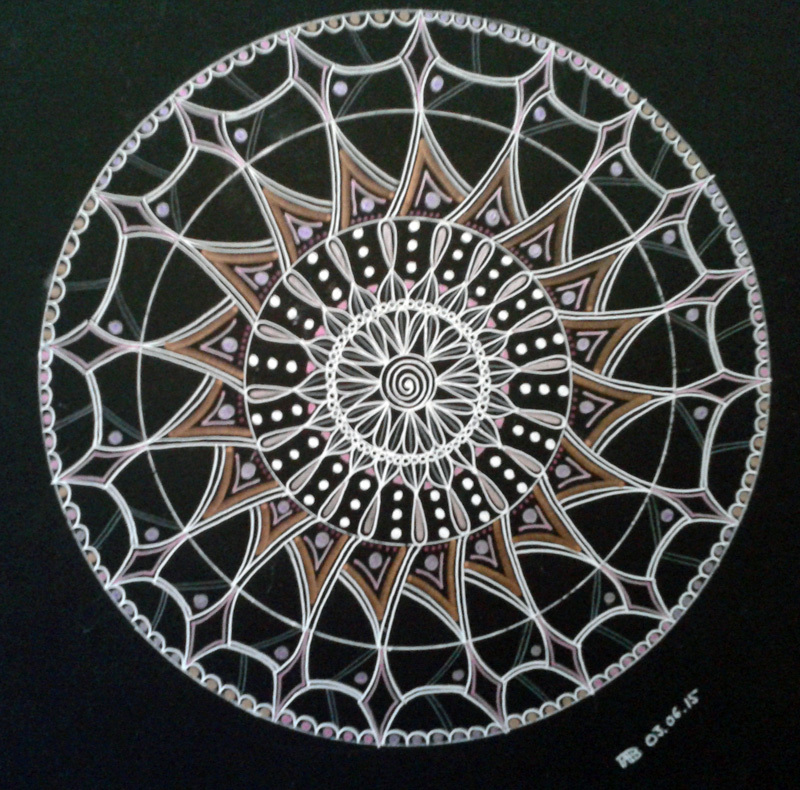 As I worked on this mandala, it gave me time to sort out which of my many ideas I wanted to focus on next. Drawing this mandala was so much more than making a pretty picture, it offered me a tool for brainstorming. By the end, I found some clarity as to what my next step and project would be. In fact, I uncovered in this tangle mess my next “star” project. 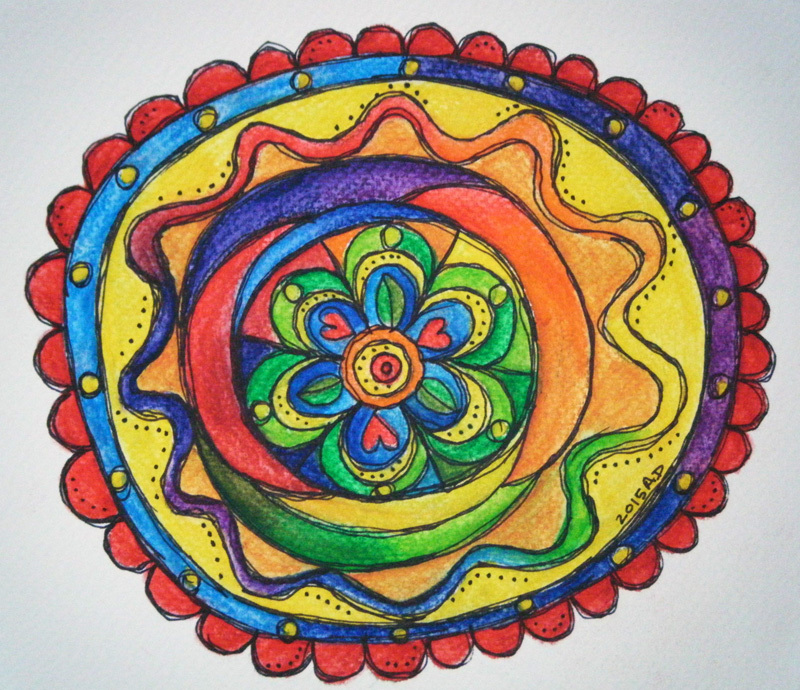 I completed my mandala feeling energized and empowered. To emphasize the message of my quotation I did a quick and simple organic mandala. I used 300gsm watercolour paper, Inktense pencils and water, and a Sharpie fine and ultra fine black marker. It’s a mandala (the first one) for my beloved son Florent who passed away six years ago. I know and I feel that Florent showed me the way to the magy and power of mandalas. With his brother Benjamin, Florent helps me, guides me and gives me strength to go on and see hope and light in the darkness. It’s usually not easy for me to draw on black paper, I find it quite difficult. But for this mandala, it happened by itself. I drew 4 white circles. No lines. No marks. Yes, Florent guided me. Fabienne Tosi is a freelance translator living in Geneva, Switzerland. She’s both French and Swiss and her interests outside of her work are to raise awareness about dangerous games to save young people and to accompany people nearing the end of life. She discovered mandalas through meditation. One gorgeous book filled with inspirational quotes and art is Inspirational Quotes Illustrated: Art and Words to Motivate by Lesley Riley. Get it. It will definitely inspire your mandala practice. This is nice,.but why not include the quote in the drawing?? Sometimes I do include quotes and journaling within my mandalas. In this case, I didnt.